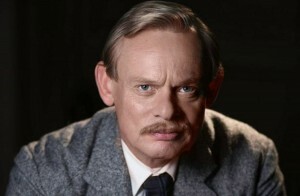 Martin Clunes returns to DOC MARTIN on PBS. ©PBS. HOLLYWOOD—Martin Clunes returns as the brash yet brilliant titular village physician in Britain’s “Doc Martin.” The long-awaited seventh series (season, as it is referred to in the U.S.) of the popular medical comedy premieres Thursday, Jan. 14 at 8 p.m. on some PBS stations. In Los Angeles, it airs on KCET, a non-commercial education independent television station. American Public Television distributes the series in the U.S., and PBS stations may carry it. Visit your local station’s website for updated schedule information and other bonus content. Clunes, 54, has been playing Dr. Martin Ellingham since the series premiered in 2004. The series airs every two years thanks to a comfortable schedule that allows the show’s writers and producers (including Clunes’ real-life wife Philippa Braithwaite) a generous amount of time to write and film the series on location in Port Isaac in Cornwall (which stands in for the fictional seaside village of Portwenn, home to colorful villagers). As Dr. Martin Ellingham, Clunes plays a GP whose combative attitude and tactlessness regular creates mayhem in the sleepy seaside community. In the season six cliffhanger, viewers watched as Martin saw his beloved wide, Louisa (Caroline Catz) and young child leave him. Season seven season picks up with his plan to win them back. The award-winning actor apologizes profusely by phone because a train delay has pushed back his interview time just days before Christmas. Unlike his iconic TV character, Clunes is personable and has an easygoing manner. He laughs easily and clearly enjoys playing his curmudgeonly character. Q: The setting for your series couldn’t be a more perfect advertisement to visit Port Isaac. I can see why you’ve been doing this 11, going on 12 years. Clunes: (He laughs.) Yeah, until we get found out. Q: You’ve been playing this role for such a long time. How do you find new amusing, entertaining storylines for the good doctor and the crazy residents of Portwenn? Clunes: I don’t know. I have to say it’s largely down to my wife, who produces the show. She keeps an overall eye on all the characters, all the character development and plotlines, and so I just have to look after the Doc, really. People seem to be interested in him and what he does. People can bear a little repetition, like an old crooner singing a favorite. “Let’s have him get cross with the Doc again.” People seem to like him to get cross or suffer in some way or another. (He chuckles.) I don’t know why I’m laughing. Q: Judging by TV interviews with you, you seem to be the polar opposite of Doc Martin. Do you think he’s the opposite of you? Clunes: I think in some ways, yes. But there’s a part of me that wishes I wasn’t so relentlessly bloody cheery all the time, and I wish I could be a little bit more like him. I’d get a few more people out of my way, I think. So part of me aspires to having that strength of will and determination. What lets him off everything is his ability as a doctor. That is almost superhuman once he gets it right. It’s really good fun to play. The scenes I really love are the ones with Caroline Catz, the Louisa scenes, because like a lot of GPs, these patients can get a little tiresome. But the scenes with her are always a joy, always funny and there’s always something to act and get your teeth into, if you know what I mean. Q: Caroline’s not in the first episode of the season seven. I’m sure your fans are hopeful she’ll be back and there will be some reconciliation between your characters. Clunes: You never know, do you? They couldn’t be in a worse situation, could they, after the last time? Q: The doctor is trying to reform, though. Clunes: Yeah, he is trying. His salvation is that, of course, he loves her, and she loves him. But we’ve had a lot of fun with this therapy strand. It’s been a really good place for us to take them in terms of freshening the story up and seeing different sides of them and each other and them together that we haven’t seen before. And Caroline’s such a brilliant comic actress as is Emily Bevan, who plays the therapist. Q: She’s like Doc Martin’s mirror image, isn’t she? Q: You never crack a smile on this show. There must be dozens of outtakes of you breaking into laughter. How do you keep a straight face? Clunes: Enormous paychecks. (He laughs.) Again, I’ll do anything as long as I think it’s funny. The joy of it is that he doesn’t smile when other people might. It is a pressure but it’s good to have a challenge at work. Q: Have you thought about taking him out of the U.K. and putting him in New York, for example? 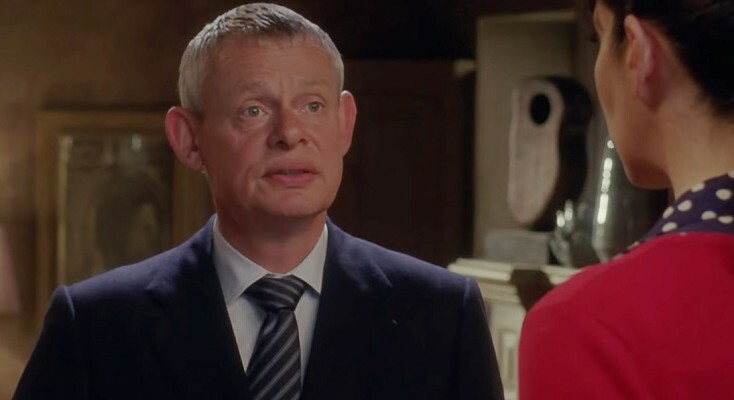 Clunes: We haven’t, because we’ve always seen Port Isaac as a character in the show. That’s what the show is. There used to be a tradition over here of shows doing a Christmas Special, where they go to the Bahamas, or something. There would be a scene of the characters wearing shorts or at the airport, and there would be a swimming pool, which turned out to be disappointing, whereas you’d be much happier if they were just left doing their thing. But never say never. There may come a time when this very ancient doc needs to spread his wings. Q: You have a special guest star this season with Sigourney Weaver. Can you talk about working with her? And how did it come about? Clunes: I was on a chat show over here, “The Jonathan Ross Show,” and Sigourney was another one of the guests. We were just talking beforehand and she said, “You’ve got to tell me all about Port Isaac and ‘Doc Martin.’ I’ve watched every episode.” She is a really old and really good friend of Selina Cadell, who plays Mrs. Tishell, our chemist. My wife was at the chat show, and afterwards we were yakking away and Sigourney said, “You’ve got to get me in it,” so we wrote this little self-contained story that would only took two days to shoot, half expecting her not to be able to do it, but lo and behold, she did turn up. Her husband Jim (Simpson, an actor and director) was with her. She was just exactly what you’d hope for from a big star. She was so nice and gracious and a little nervous. She’d worked hard on her part. She knew her lines. She had worked on her backstory. She was literally everything you could have asked for. It was a joy. I was so excited I fell off my chair twice. Q: Is she a patient? What’s her character? Clunes: She’s playing an American tourist who’s trying to get some prescription drugs at the counter, which you can’t do in England without a prescription from a doctor. She says, “But I’ve got a credit card!” She just wants it. It’s not particularly harmful what she’s after, but she’s met with a brick wall. So she gets to do a scene with her friend Selina as the chemist, who is rude to her. And then I come into the scene and I’m rude to her. Then she comes up to the surgery (Doc Martin’s office) and I was really rude to her. It was great fun. Q: Are you actively involved in the writing process? Clunes: I get added to it much later on. Q: Doc Martin’s Aunt Ruth is ailing but is she going to be okay? Clunes: She’ll be okay; she’ll pull through. It’s nice to have that because that really scares him too when she looks frail because she means a lot to him. Q: You have a new character that’s a veterinarian. Clunes: A holistic veterinarian. (He laughs.) There are a few things you can think of that would guarantee to annoy the doctor, and a holistic veterinarian, whose father was the previous (general practitioner) as played by my friend Caroline Quentin. Q: Is she a recurring character? Clunes: No, she’s only in one episode, but I wouldn’t be surprised if she came back. Well, the dog drives she so mad that I try to put it down. I call all the vets and see if they’ll put it down. I say, “Here, I’ll do it myself.” I get thwarted with that and then I have to re-home him with a holistic vet. Q: You have a fun relationship with your latest assistant, Morwenna, played by Jessica Ransom? Clunes: She’s perfect, isn’t she? Q: You’ve had some great assistants over the course of the series. Do you stay in touch with first season’s Lucy Punch? Clunes: We’ve launched a few careers. Yeah, she was in that film with Cameron Diaz (“Bad Teacher”). She went to town in that. Q: What do you foresee for “Doc Martin?” How much longer can you go? You’ve been playing this character for 12 years. Clunes: It is hard. It’s tough to find stories where we aren’t simply repeating ourselves each season. That’s one of the reasons we take a year out each time so we can focus on getting it right. In the U.S., the returns are so massive, you can afford a table of writers; we can’t afford a table. It’s a hard graft and a lot slower. I’m not sure where we’re going to go next because we’re not going to think about it until 2016, but we’ll think of something. Clunes: Yeah, there is. It’s been an ongoing discussion for a long time. Marta Kaufmann is its champion. They want to make it very different. They were talking about making it a half-hour show, like a sitcom, maybe. That would be different from ours, which is sort of a drama-comedy thing. It’s down to the casting, I think, a lot of it. But who knows. There’s a slight disincentive in America to sell it on because we’ve sold ours so many places. There was just a healthy a market for the American “Office” as there was the English one, wasn’t there? So, who knows? Q: What are you looking forward to most in 2016, personally or professionally? Clunes: We do this show every other year so I’m looking forward as I was very aware at the end of the summer I had to pinch myself. Self-employment is a terrible taskmaster. I just want to take some time and live the life I’m fortunate enough to have rather than spending the whole time paying for it or working for it. I’m going to do a quick documentary in Australia in the early part of the year, and I’m just looking forward to having the summer at home. I want to ride my horses a lot more. I’m trying to teach a Clydesdale and myself dressage, and it’s not pretty. I’m going to try and perfect that over the summer. I just want to live a bit more and work a bit less, I guess. We all work so much, don’t we? Q: What is the documentary about? Clunes: It’s about the islands of Australia, of which there are 2,700. I did (a documentary) about the islands of Britain, which was popular in Australia, so we’re making that for Australian TV and then we’re going to sell it back here (in the U.K.) In the autumn, I may be going to the U.S. to make a documentary about the Pony Express.